These stones give beer a bubble boost, making bottled and canned brews taste fresh out of the tap. It's hard to top beer on tap. It comes out all bubbly, with rich frothy foam capping off the last inch or so of hoppy goodness. Replicate that draft beer experience at home, no keg required, with these soapstone nucleators. Nucleation (a fun science word!) is what happens when you pour a carbonated beverage and those little gas bubbles start doing their happy dance. 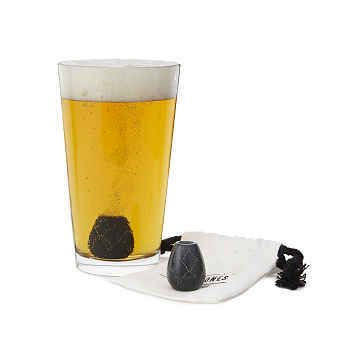 Place one of these stones in a pint glass and bubbles will gather around it as you fill the glass from your can or bottle. The active carbonation not only helps you get a thick, lacy head that will last until you finish your drink, it also enhances the beer's flavor and aroma while reducing acidity. Keep them stowed in the freezer (in the included reusable cloth pouch) for an added bonus: a colder brewski with each fizz-ilicious sip. Made in Minneapolis, Minnesota. Set comes with two stones. Rinse under water to clean. Store in the freezer to keep your first beer colder. My brother-in-law has used it frequently in can and bottled locally sold microbrews. He said the flavor is better with these stones and is more enjoyable. He is really impressed with them. Great gift for the guy with home kegs/taps. Beer stones really bring out the aroma! I use my beer stones in everything from lagers to stouts. They preserve a full head, and bring out the aroma of whatever beer I choose. I have given multiple custom sets to friends and family, and would highly recommend them.